Swans fans who can remember Terry Yorath being the gaffer might well recall a young left back being signed from Leeds United by the Swans in July 1986 – a certain Terry Phelan. After making his debut at the Vetch Field against Stockport County in August 1986, Phelan went on to form an effective partnership down the left flank with a midfield maestro named Tommy Hutchison – who incidentally was one of my favourite Swans players of that time! The ever present and reliable Phelan played an impressive 58 times for the Swans during the 1986/87 season, when they were playing in the ‘Today League Division 4’. Phelan was quick and loved getting forward whilst never neglecting his defensive duties, which he also excelled at. At the end of an impressive debut season at the Swans, it came as no surprise that Phelan was snapped up by a club higher up the football ladder (at that time) and the crazy gang from Wimbledon duly paid the Swans a £100,000 for Phelan’s services. 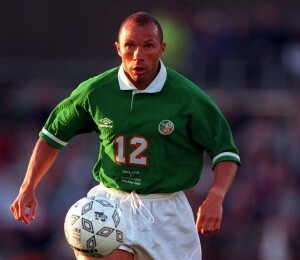 Some 12 months later he won an FA Cup winners medal with the Dons was capped by the Republic of Ireland in 1991 – before going onto win 41 caps for his adopted country and playing in the 1994 World Cup in the USA. During his playing career Phelan also played for Manchester City, Chelsea and Everton – which was testament to how good a player he was. Phlean moved into coaching in 2001 and he took roles in the USA and New Zealand before returning to his native north west. He now works for the Templegate Training Sports Academy in Liverpool.